In a sentence or so: Saba’s twin brother Lugh is kidnapped and she will do anything and go anywhere to rescue him.Saba, Lugh, Emmi and their Pa live on a little bit of dry, miserable land by a watering hole. They seldom see people, and when they do, they’re suspicious. And rightfully so, because when a group of men rides up, notes Lugh’s (but not Saba’s) crescent moon mark on his face, they kidnap him. Their Pa dies in the effort to prevent him from being kidnapped, but not before telling Saba that she will need to be strong. That people will need her. That her time on this earth is not even close to being over.So off Saba and Emmi go, across the vast unsafe world to find Lugh. They aren’t the biggest fans of each other, since Lugh is really the one that bonded them together, so the trip is even harder than it would be otherwise. Saba is soon swept up into a dangerous world where she is desperate to survive if only to rescue her twin and keep Emmi safe. Corrupt dictators, harsh desert like environments, cage fighting to the death, and ambush are just a few of the struggles Saba has to face in Blood Red Road. Don’t worry though. It’s not ALL awful. She does meet a boy with gray eyes named Jack who just might be the perfect boy for her. He’s calm, thoughtful, and just a touch silly where Saba is anxious and uptight and all business all the time. Quite a pair, those two.I feel like my review for this book simply cannot do Blood Red Road justice. Moira Young writes in dialect (which did not bother me in the slightest, as you KNOW I loved The Chaos Walking Trilogy) that helps set the tone for the book. Saba is in a very different and considerably more harsh world than the one we know. While there isn’t a ton of world building, that was okay because really it’s more about the characters in the world. Which isn’t to say you don’t get a feel for the climate and craziness of the peeps in charge. OH you do. 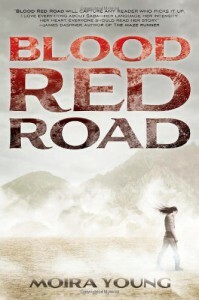 I can hereby claim Blood Red Road by Moira Young as one of my all time favorite dystopians. I loved Saba and her curmudgeonliness mixed with bravery and dedication. I loved Jack and his ability to soften Saba yet still let her be who she is meant to be. 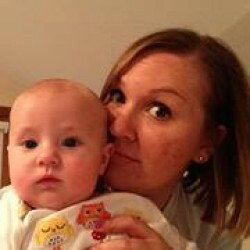 I loved Emmi and her wisdom and courage. I loved the crazy plot of Blood Red Road because you really don’t know where you’re headed - just like our lovably cranky heroine. Fave quote: "They call me the Angel of Death." (164 ARC)Pairs well with: Okay, bear with me on this one. It's definitely lulz but it always reminds me of Jack and Saba. She don't know she's beautiful!